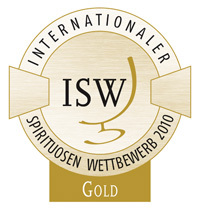 The “Internationaler Spirituosen Wettbewerb (ISW)” is the only spirit award in Germany, following the strict rules of the International Organisation of Vine and Wine OIV. It offers the possibility for producers, importers and marketers of spirits to rate the quality and class of their products in a direct comparison. That provides a valuable guidance for marketing the awarded products as well a meaningful point of orientation for end consumers. A jury of 49 experts, professionals from industry, scientists of teaching and research establishments as well as experienced barkeepers and distillers from Germany and abroad examine the entries according to a strict process and complied structure. First of all, the liqueur is rated by its look (colour and clearness). Followed by aromatic evaluation: the taster judges the smell of the product (purity and typicity). Last but not least the taste. The tongue hast to confirm the perceptions of eyes and nose. Finally the judges rate the overall impression. This involves the harmony of the aromas and the way these are integrated into the alcohol. This year the Internationaler Spirituosen Wettbewerb received more than 600 spirits from over 37 countries for tasting and rating. That honours the outstanding quality of our herbal clear liqueur by one of the most influential competitions in Germany. These awards are at the same time an esteem of the work done and an incentive and obligation for us to move on without compromises.